Variation 4 starts with the same first row as Variation 3. 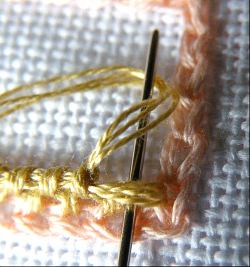 At the end of the row, take the thread across the work to form a cording (padding) thread for the next row: bring the thread through the first chain on the right, as shown. 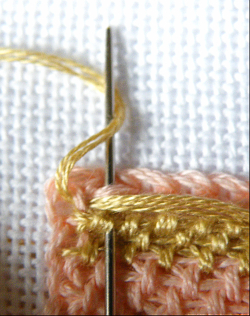 Start row two by picking up the bar between the first two knots of row one and then picking up the cording thread. 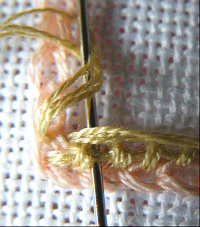 Make the stitch as normal, over these two threads. 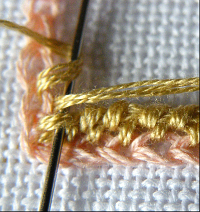 Continue along the row, making one stitch between each pair of knots in the previous row, each time picking up both the bar between the knots and the cording thread. 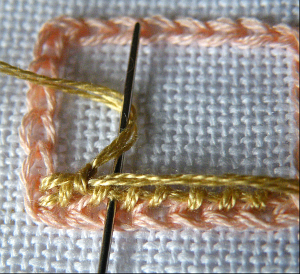 The last stitch is made into the bar between the seventh knot of the previous row and the edge chain. Bring the thread through the second chain on the right, carry it across and bring it through the second chain on the left, ready to start row three. 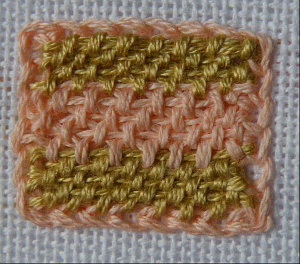 Row three is worked like row two, except that the first stitch is worked on the bar between the edge chain and the first knot of row two, and the last stitch is worked between the six and seventh knots. Bring the thread through the second chain on the right, and carry it across to the second chain on the left ready to start row four. Row four and all even-numbered rows are worked as row two. 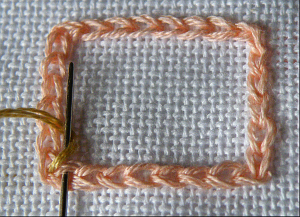 At the end of even-numbered rows, make the cording stitch using the next chain on the right and the next chain on the left. Row five and all odd-numbered rows are worked as row three. At the end of odd-numbered rows, make the cording stitch using the same chain on the right and the same chain on the left as the previous row. 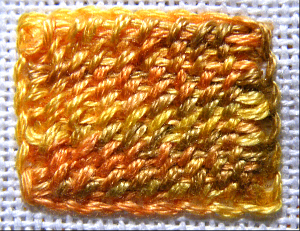 After working row eleven, make the cording stitch ready to start row twelve, which joins the work to the top row of chain stitches. Row twelve is worked like row two, but before making each stitch you pick up three threads on the needle: the bar from the previous row, the cording thread and then the inner loop of a chain in the top row, starting with the second chain from the left. 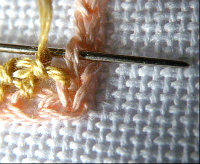 After the seventh stitch, take the thread to the back of the work and fasten off. This variation can also be worked right to left, making every row like the second row of Variation 3. Another version is to work every row after the first the same as row three, for a more pronounced diagonal slant to the knots – starting each row into the space between the edge chain and the first knot of the previous row. The random-yellow sample at the top of thepage is worked in this way. Any of the other variations can be also corded (for Variations 1, 3 or 5, you will need to use a separate thread for the cording). Likewise, you can work smooth trellis in one direction without cording, by taking the thread across on the back as for Variation 2, or starting a fresh thread for every line.